Improve your Discovery's braking with our all-new braided stainless steel brake hose kits. These durable stainless steel mesh hoses feature an internal Teflon liner and a sealed clear coat on the outer mesh. The stainless steel and teflon construction provides a long-lasting hose, unlike standard rubber hoses that become brittle, crack and fail over time. They provide less flex and expansion under pressure than traditional rubber hoses, providing better brake pedal feel and braking response! This kit is for vehicles with raised suspensions - hoses are 2" longer than the standard kit specifically for raised vehicles. 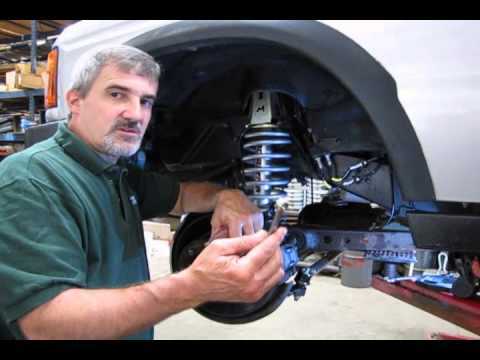 Now that we have added a raised suspension for off-road use, watch Doug, our Land Rover Master Technician, in Part One (Extra) of our video how-to series, as he removes and replaces the standard brake hose on our project D2. Doug then upgrades with and installs our exclusive performance braided stainless steel brake hose (part # ABP218L) for Discovery Series II with raised suspension. Doug will also demonstrate how to bleed the brake system using the Hawkeye Diagnostic Tool "Power Bleed" Function. Questions about this video? Call us at 1-800-533-2210 or contact us via live chat.